Last Autumn (that’s 2012, for those of you from the future reading this) I received a letter via the Surrey Archaeological Society from Steve Bullar, a gentleman in south-east London who had been investigating the age and purpose of another Anglo-Saxon ditch, one that thankfully is very easily identifiable in the present day. 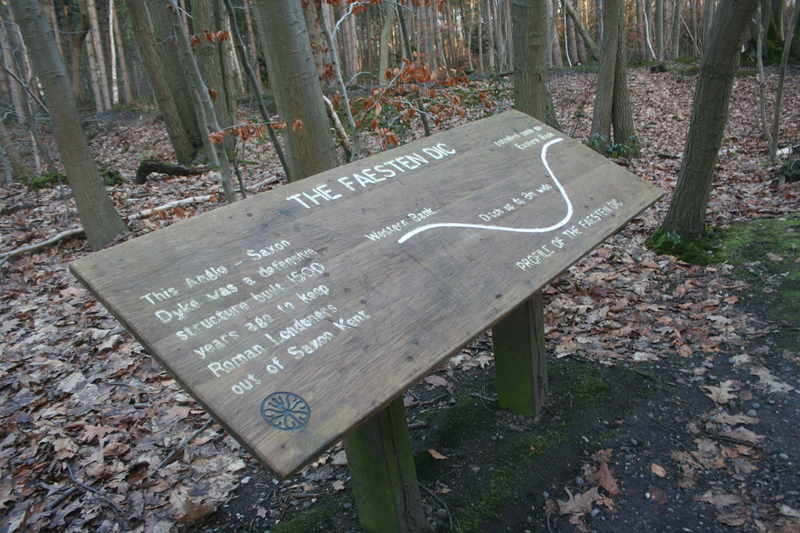 Known as the Fæsten dic after the name by which it appears in the boundary clause of S 175, a charter concerning a ten-sulung estate of Bexley, extended sections of it survive in Joyden’s Wood. It had been my intention to go visit the ditch soon after receiving the letter but various things prevented me from doing so. However, having divested myself of distractions like a job and seizing the opportunity presented by a rare sunny day, I hopped on the train and headed for the woods. The reasons for this line of thought are easy enough to discern. The Anglo-Saxon Chornicle annal for 457 records the purported victory of Hengest and Æsc over the British at nearby Crayford (Bexley lies in the Cray valley), subsequent to which the defeated “forsook the land of Kent, and in great consternation fled to London”. Mortimer Wheeler correlated the Fæsten dic and other linear earthworks to the north of London with the Saxon settlement of the Thames basin (as referenced in the first page of this 1968 article by Richard Bradley), with all the implicit confrontation and combat this would have entailed. Such interpretations feel underwhelming, in that they fail to consider how the ditches were built and, more importantly, at who’s behest. Was the Fæsten dic really a product of an “all hands on deck” collective local response to a crisis? It is unfortunate that the charter’s purported date of 814 is more than likely false and consequently cannot be used as an accurate terminus ante quem for the creation of the ditch. I have found at least one online suggestion that the Fæsten dic is in fact “primarily Iron Age” in date, echoing the multiplicity of opinions as to the origins of other linear earthworks such as the East Wansdyke in Wiltshire. At one stage, I considered the fact that the ditch is called the “strong(hold) ditch”, rather than a more generic name referring to its size (e.g. “big/great ditch”) or presumed constructor (e.g. “Woden/Grim/giant’s ditch”), pointed to recent defensive relevance and hence to it having originated or being reconditioned and reinforced in the Anglo-Saxon period. However, John Baker’s definitive study of Old English fæsten draws the conclusion that the term had “a more figurative use in place-names than might be suggested by textual sources” (2008, 341). There are six, possibly seven, known instances of the compound fæsten-dic, including another from a set of Old English charter-bounds from Crondall just to the west of Surrey (S 820; Baker 2008, 341-42). 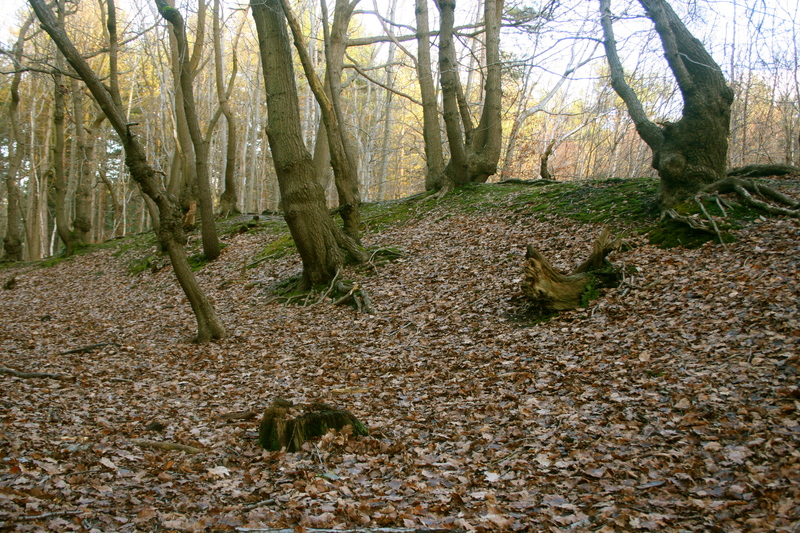 Instead of emphasising the defensive function/nature of the ditch, the choice of the specific may be a roundabout way of describing its inaccessible or remote situation – certainly appropriate for the earthwork in Joyden’s Wood under discussion here, even if it is a little too close for comfort to humdrum suburban housing these days. This being the case, the formation of the name cannot be taken as unequivocal evidence of either the age of the ditch or its function in the Anglo-Saxon period, merely that it was adjudged to be of fæsten-like character. Game over, then? Maybe not. Unlike Mr Bullar, I believe the name Fæsten dic should be assessed separately from the rest of the the above-quoted boundary description. The key term here is haga, which I deliberately avoided translating above. LangScape renders it as “hedge” but Della Hooke has made repeated suggestions over the year that it was applied to “wood-banks topped by hedges or fences” that delimited areas of woodland reserved for hunting (e.g. Hooke 2010, 142-43, 153-55). Perhaps the Fæsten dic became part of an extended haga boundary which – if the name cyninges healh is taken at face value – was associated with royal hunting activity on one side or the other. As to the origins of the Fæsten dic, at this point it is worth making a couple of points about the nature and location of the surviving earthworks. From the first of the above photos, it can be seen that the largest bank sits on the eastern – Kentish – side of the ditch, indicating it was meant to repel/dissuade attack from the west. Looking at it in the wider landscape, it occupies a position on the interfluve between the valleys of the Cray and the Darent. Taken together, the two facts suggest there was something worth protecting to the east and not the estate centre at Bexley. There are various indications of important early/mid-Anglo-Saxon activity from along the Darent, including an as-yet unpublished “high status” settlement site at Eynsford, about which I would love to know more. If the key to understanding the function of the Fæsten dic lies in an appreciation of the work involved in constructing such a defence and who would have had the authority to commission it then one candidate that stands head and shoulders above the rest – the royal house of the Kentish kingdom. We know that it was probably among the earliest of the Anglo-Saxon kingdoms, whose royal house was clearly well established by the time of the arrival of the Augustinian mission in 597. However, the geographical restrictions imposed by the Kentish peninsula and its environs meant it gradually lost out in the competition between the other Anglo-Saxon kingdoms in the seventh to ninth centuries. Kent fought the West Saxons in 686-87 and the Mercians in the 770s and it would make greater sense to apportion the Fæsten dic (though not necessarily its defensive name) to this period, either as an emergency response to impending attack or a strategic defence/deterrent. Pictures of earth banks are never that interesting, are they? The Fæsten dic was attributed to this period and the Kentish crown by the authors of The South-East to AD 1000, who made the interesting if not particularly accurate comment that it “faces towards Surrey” (page 288 – they also provide a useful map of the known extent of the ditch). It is one of a quartet of linear earthworks discussed as products of the political rivalries and realities of the middle Anglo-Saxon period and, remarkably, the other three are all in Surrey. Among them is the kilometre-long linear earthwork on the present Surrey-Kent border, bisecting the modern-day A25 like an enormous roadblock. Again it comprises an easterly bank and westerly ditch, intimating its purpose was to shield the Kentish side; the place-name of nearby Westerham (“western hām“) may have some underlying strategic significance. 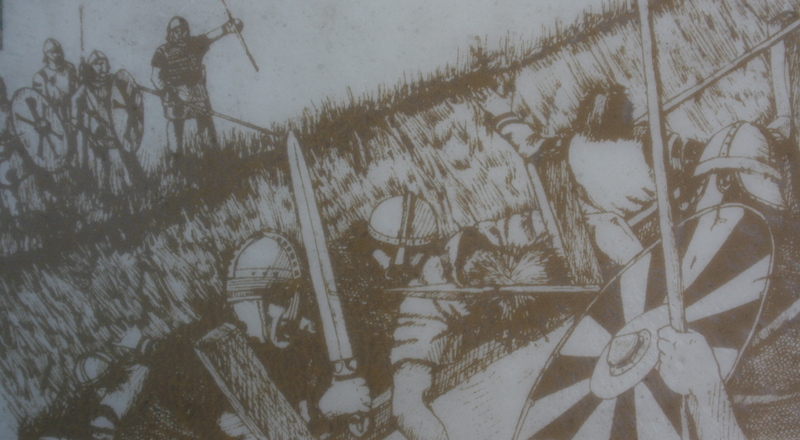 It was subject of a short article by Tony Clark published in volume 57 of the Surrey Archaeological Collections, in which the Anglo-Saxon Chronicle was used (perhaps not-altogether wisely) as a historical framework to float the idea that it was constructed by the Kentish kingdom in the wake of its defeat at the “battle of Wibbandun” in 568 (1960, 72-73). An origin connected to the later, better-documented confrontations between Kent and Wessex/Mercia seems more probable. There is no evidence that it part of a wider defensive network, although there may be some mileage in close attention being paid to the line of the county boundary and its environs, particularly where it is crossed by historically-important roads. If there are any conclusions to be drawn from the above, it is that the construction of the Fæsten dic and the Kent-Surrey border entrenchment serves to demonstrate that the Kentish kings of the late-seventh and/or eighth centuries effectively renounced all claim to Surrey as part of their kingdom. This is in spite of the long-recognised close archaeological connections between western Kent and east Surrey in the preceding centuries. Kent had to concentrate on preserving its independence and did so with no little gumption, even if this was ultimately all in vain. Surrey was thus left to be fought over by Wessex and Mercia; it is worth noting that there are no earthworks that look like they were created by its inhabitants to keep out one or other of the aforementioned powers. Thus the Fæsten dic, with a name misleadingly redolent of a military function, had nothing to do with keeping “Roman Londoners” out of Kent. 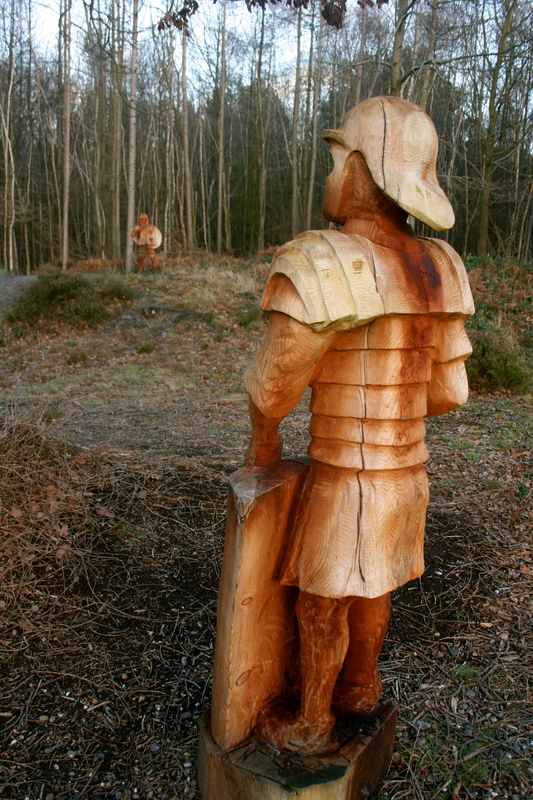 But a Mercian warrior wouldn’t make a such an interesting statue, would it? Interesting summary but I’m not convinced. The ditch was certainly not built to protect Anglo Saxons from London Romans as they were the same kin. At the top end of the ditch is the Roman settlement and tile killms, the ditch then runs from this site to the earth works in the middle Valley which are late sub Roman or Anglo Saxon, the ditch then links with the valleys to reach tile kiln lane and I suspect follow the old track to Wansunt next to the Watling St being the Roman rd. During the Sub Roman early Anglo Saxon period Dartford and the surrounding industrial areas were prone to raids and pirate attacks hence the watch tower Tower at Dartford similar to the one on the highway wapping this the ditch was used as a sheltered road way to the Roman road. You dont have a defensive ditch if there is no one there to defend it and I agree the explanation given to tourists is dross. This theory has credibility based upon the number of treasure hunters I find tracing the route to the Roman road. Hi Alisdair, thanks for taking the time to post your very interesting comment. It sounds like you have a great deal more local knowledge than I possessed at the time – or now for that matter! If I follow what you’re saying correctly, it seems as if you’re arguing for a Late Roman origin for the ditch? That would be feasible I suppose. What is the evidence for dating the Roman settlement and kilns at the top end of the ditch? Likewise, how/why have the earthworks in the middle valley been attributed to the period(s) to which you refer? I’d be keen to read more about the archaeological context of the ditch. Not sure I would agree that Dartford and its hinterland would have continued to have had sufficient importance in the sub-Roman period (if by which you mean post-AD 410, to use the date everyone else uses!) to warrant the construction and manning of the ditch. Then again, perhaps your superior local knowledge could fill in some of the gaps in my own understanding of the area?! I read that the Wapping tower site was most active in the second half of the 3rd century AD, and that by circa AD 365 its walls were being robbed, so I’m not sure of the extent to which there is a valid parallel with whatever was going on in and around Dartford. I’ve seen something not dissimilar to your idea of a sheltered roadway suggested as a means to explain the cross dykes found on the chalk downs of other parts of southern England. Personally, I question the amount of physical labour involved relative to the advantages gained from making such a route, particularly since the bank which would have “sheltered” the road was apparently facing away from the source of danger, and at what time such a construction would have been required. Then again, perhaps I’m being blinkered and we should turn around our approach to the ditch and see it as “facing” east, not west?